A page from the minutes of the Orphan’s Court, York Co. Pennsylvania . Book B. p.72. 3rd March 1765. “In the New Acquisition being the first and only one ever erected in the State of South Carolina, is now in blast, and if no unforeseen accident happens, will so continue, at least 12 months, in which time may be had, by wholesale or retail, Bar and Ploughshare Iron, Smiths and Forge Anvils and Hammers, Salt Pans, Pots of all sizes, Kettles both for kitchen and camp, Skillets, Dutch Ovens, Sad Irons, Spice Mortars, Waggon, Cart and Truck Boxes, Stoves, Andirons, Swivel Guns, and Cahorns, of any size, 2, 3 or 4 pounders, with balls to suit, with any sized Cannon Ball or any other casting in iron. Apply on the spot to William Hill, or in Charleston to Isaac Hayne. Figure 1 , Hill’s grave, Bethel Cemetery . York Co. S.C.
A letter from Gov. John Rutledge of South Carolina to the delegates of South Carolina in Congress, dated 8 Dec. 1780. Published in Moultrie ’s “Memoirs of the American Revolution.” Vol. II, p. 239. Excerpts from a letter written by M.A. Moore to Lyman Draper. Sumter ’s papers. “Col. Wm. Hill, of York Co. S.C.—Gen. McMackin?? Knew him from his boyhood, having been raised within two miles of Hill’s ironworks. He was about five feet, ten inches—spare built. Before the war he had imported a fine horse named Flein Nass? ?, which became a great favorite with him. Hill was a blacksmith—made his own spurs, and mounted Flein Nass for the war. Hanging Rock—In this fight, Col. Hill was shot under the shoulder blade, and the blood spirted out—seeing which, the surgeon said—“let me take you off the field—you cannot long survive—and had better be where you will not be run over.” “If I die, I’ll die upon Flein Nass,” said the wounded Colonel, and putting spurs to his horse dashed from one end of his regiment to the other, encouraging the men—explaining in his sonorous voice, through his nose—“fight on, my brave boys—I’m mortally wounded.” He kept in the saddle till after the action and carried the lead in him to the grave. In Charlestown during the war, Col. Hill’s partner in the Ironworks, Isaac Hayne was hung by the British. After the war, Col. Hill had to mortgage his land to rebuild the iron works. September 1786, William Hill of York County, New Acquisition, to Joseph Atkinson and Daniel Bourdeaux both of Charleston, 4350 pounds, nineteen tracts: (1) ½ of tract on the south side of Catawba River on Crowders and Ellison’s Creek below the lower little mountain, granted to Robert Patrick 28 March 1755 and bequeathed by will 10 September 1776 to James Patrick and conveyed by him to Wm. Hill 24 October 1783, 600 acres, (2) ½ of a tract on the south side of Crowders Creek joining James Dougherty, Joseph Bradner, William Patrick, 195 acres granted to Alexander Curry 15 May 1772, conveyed by him to Wm. Hill 8 November 1783, (3) ½ of the tract on Ellison’s creek joining William Steuart, 270 acres, part of a grant…. I love you guys but I’m not typing all 19 descriptions. As you see Col. Hill owned lots o property. York county deed book B. P.177-193. Published in The Bulletin of the Genealogical Society Of Old Tryon County, Inc. P.55. 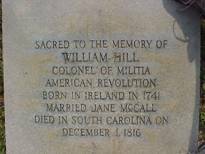 “19 May 1789, William Hill of York Co. etc. part of all those works for the manufactory of cast and bar iron known & distinguished by the name of the Era Iron Works in York Co….. which consists of the Era and Etna Furnaces, a steel furnace, a forge with four fires, a cupola with all the various improvements….lands….12000 acres, for the full term of 500 years….. The following letter was written by Colonel William Hill in 1815. In it he shares with the readers his fears that the history of the Revolution has not been recorded accurately and that General Sumter and himself were being left out. 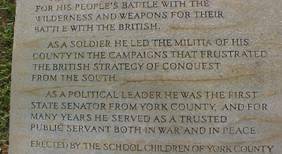 It is Colonel Hill’s claim that he alone was the one who planned the assault on King’s Mountain. This information is from Lyman Draper’s research on the Revolution in the south. 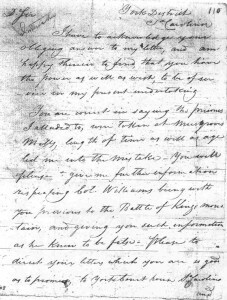 A letter from Col. Hill to Mr. Miller, concerning an unpaid bill presented to Col. Hill from Mr. Thompson, Blacksmith, for services rendered during the Revolution. Mr. Miller was the manager or agent on the project to open the Catawba River to navigation, ending at a point some thirty miles from Hill’s Ironworks. This information is from Lyman Drapers research on the Revolution in the south. I am sir your —– Svt. 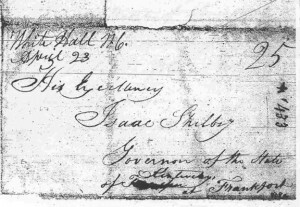 Figure 2 – William Hill’s envelope to Isaac Shelby.